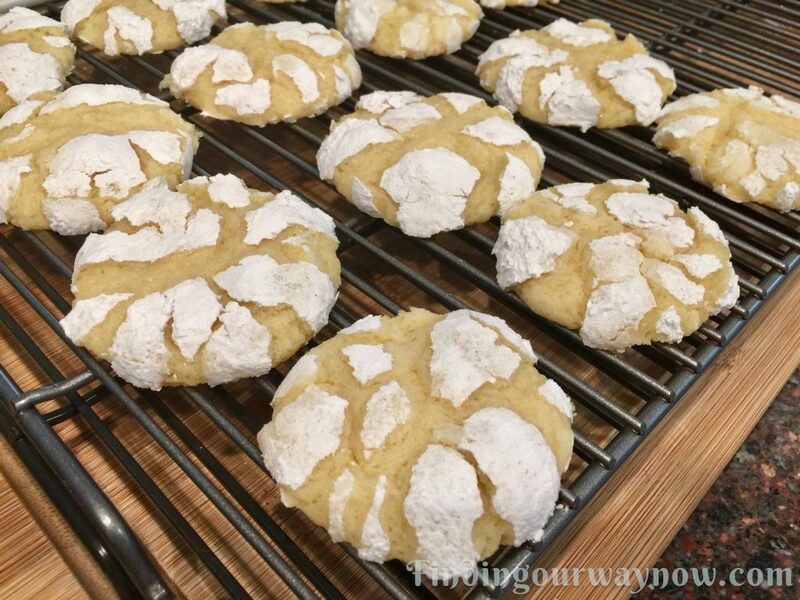 With a lemon lover around you can never go wrong with these Lemon Crinkle Cookies. Besides, who doesn’t love cookies? When you pair these with my Chocolate Crinkle Cookies, you will have a delightful combination. As it was with the Chocolate Crinkle cookies, below you will find two versions: The first recipe is from scratch; the other is semi-homemade using a lemon cake mix. Both are good, and each will have their own appeal. The homemade is more cookie-like, the cake mix version is as you would expect, more cake-like in texture. Now we’re off to making these awesome goodies. Using a stand mixer, hand mixer or a wooden spoon, beat the butter and sugar together until light and fluffy. Add the egg, lemon zest, and juice (if adding, yellow food coloring) and beat until combined, scraping down the sides as needed. Add the flour mixture, alternately, 2 to 3 batches at a time until just incorporated, scraping down the sides as needed. Cover and chill the dough for 2 hours or overnight. Preheat the oven to 350° F. Line 2 baking sheets with parchment paper and set aside. Place the granular sugar in a shallow bowl. Pour the confectioner’s sugar into another shallow bowl. Using a tablespoon measuring spoon scoop out a bit over the measure and form balls. Roll the balls in the granular sugar and then in the confectioners’ sugar until thoroughly coated. Place the coated dough balls on the lined baking sheets about 1½ inch apart. Bake the cookies for 10 to 14 minutes, rotating the baking sheet halfway through the baking. (When done, the cookies will appear less moist in the cracks and are a bit firm on the sides.) Remove the cookies from the oven, leave on the baking sheet for 5 minutes and then move them to a rack until completely cooled. Store the Lemon Crinkle Cookies at room temperature in an airtight container for several days. You may freeze them for up to 3 months. Notes: The food coloring adds a bit more color to the cookies. I did choose not to add it. Fresh lemon juice and zest is a must to achieve a bright lemon flavored cookie. Make sure to take care in forming uniform dough balls and coat them with granular sugar and then generously with confectioner’s sugar. Baking time will vary depending on your oven and the size of the cookies you decide to make. Add or subtract baking time accordingly for larger or smaller sized cookies. Using a wooden spoon, beat the cake mix, eggs, salt, zest, lemon juice, baking powder, baking soda, and butter until combined. Cover and chill cookie dough in the refrigerator for about an hour or overnight. Preheat oven to 375° F. Line 2 baking sheets with parchment paper and set aside. Place the granular sugar in a shallow bowl. Pour confectioner’s sugar into another shallow bowl. Using a tablespoon measuring spoon scoop out a bit over the measure and form balls. Roll the balls in the granular sugar and then in the confectioners’ sugar until thoroughly coated. Place the coated dough balls on the lined baking sheets about 1½ inch apart. Bake the cookies for 10 to 13 minutes, rotating the baking sheet halfway through the baking. (When done, the cookies will appear less moist in the cracks and are a bit firm on the sides.) Remove the cookies from the oven, leave on the baking sheet for 5 minutes and then move them to a rack until completely cooled. Store the Lemon Crinkle Cookies at room temperature in an airtight container for several days. You may freeze them for up to 3 months. Notes: The key to making these crinkle cookies great is always using a super moist lemon cake mix. Make sure to take care in forming uniform dough balls and coat them with granular sugar and then generously with confectioner’s sugar. Baking time will vary depending on your oven and the size of the cookies you decide to make. Add or subtract baking time accordingly for larger or smaller sized cookies. One last thing, why roll the dough balls in granular sugar and then in confectioners sugar? 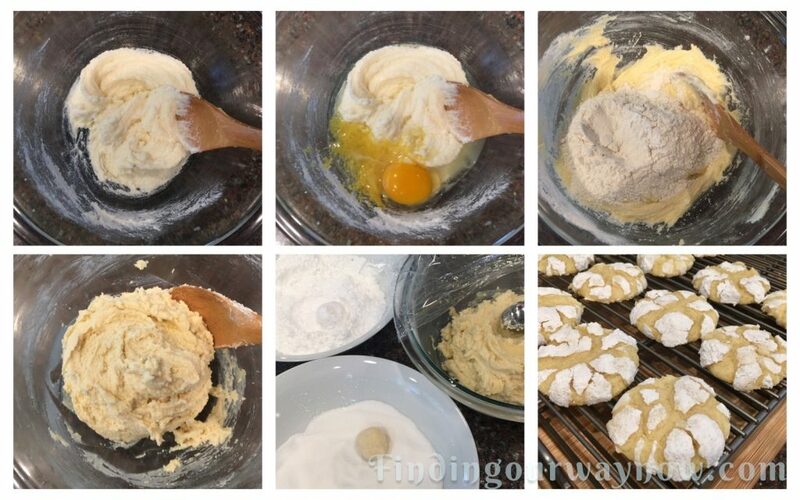 It helps to ensure the confectioner’s sugar isn’t absorbed too much into the dough while cooking which allows the crinkles to show off a snowy white appearance. It also gives the outside of the cookie a very lovely light crunch. Now, you have two types of crinkle cookies to make and enjoy. 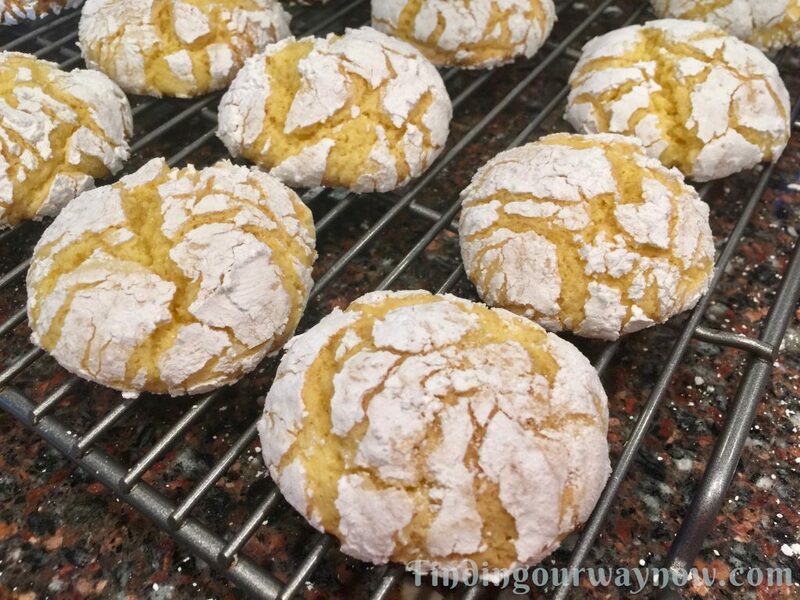 It’s been great fun creating, sharing and eating these Lemon Crinkle Cookies. The fact that I love anything lemon is another good reason.